In November of 2007, word was spreading that the historic Mullis-Howard house in Cochran was going to be demolished. It was then that I had the idea to create a book of historical images and then recreate the scene how it looked today. I had a booth at the upcoming Arts Extravaganza at the Cochran Bleckley Arts Alliance in December. I was sure I could collect the images, take my recent images, and have the book published….all in 4 weeks. Let’s just say I was a little off on my timeframe. I ran ads in the Shopper’s Guide asking for historical images. The Arts Extravaganza came and went, but I did use it to ask for photos. I kept running ads and people would come in spurts with photographs, sometimes a few people would come in a day, other times I wouldn’t see anything new for weeks. One thing that I did learn was that everyone has a picture of Jazzbo! Jazzbo was a character to say the least. I, unfortunately, never had the privilege of meeting him, but I have heard many stories. He began selling Watkins products in 1927 out of his car when he was only 16. The front bumper of the car held 2 five-gallon buckets of Watkins Fly Spray, while the back bumper held a chicken cage, for bartering if you didn’t have any money. He went on to open his store with anything and everything you could imagine. To hear people talk, it was just piles of stuff everywhere, and he knew where everything was! His store has a tragic legacy in Cochran, he lost 2 buildings to fire, one on July 4, 1980, the second on December 6, 1990. I was fortunate enough to get some great coverage in the Cochran Journal through a front page article, it really helped to spark interest in the project. I continued to collect images until August of 2009, my goal was to have the book available for the Christmas Season. In September, I went out and took all of the recent shots that I needed. Some locations had not changed much at all while others were completely different. I then compiled the book, edited, re-edited, and then edited some more until I had it like I wanted. I wanted to make sure that I didn’t throw the book together, I wanted it to be something that I could be proud of as well as anyone who purchased it. I had a proof of the book on display at the Country Fest in Cochran in October. I took preorders planning on having the final books within a few weeks. I had a great response and took several preorders. Publishing issues caused major delays in the book being delivered, and long story short, the first batch was finally delivered in Feb. of 2010. A second batch was then ordered from another publisher and these are available now. There is no limitation to the number of books available, but I am ordering them in small batches from the publisher as needed. 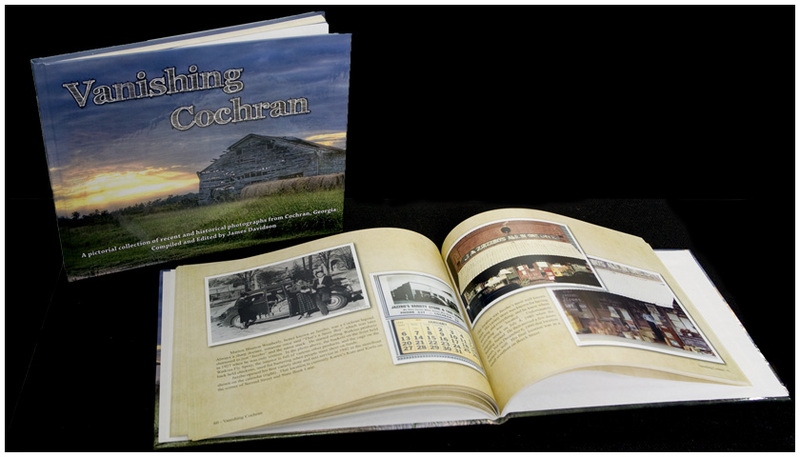 Copies are available at my studio or at Scott’s Bar-B-Que or online at http://www.vanishingcochran.com. I hope to have it listed on Amazon soon as well. I appreciate everyone who helped contribute to the book as well as everyone who has purchased a copy. It has been a labor of love and although there were times that were very frustrating in the process, it was all worth it in the end, and I hope to do it again as Vanishing Cochran Volume 2. Pingback: 2010 in review | My Art, My Life…. I saw the book yesterday in the library. It is a great book. What I don’t understand is why is the community letting Cochran vanish? Cochran is a great place to live. But I am tired of going to Eastman and Dublin to shop for cheaper prices. Yes, I go to Wal Mart. It’s cheaper even with the drive. I just don’t understand why Cochran would not allow a Wal Mart to be built here. I do understand about the local business owners. But it’s 2011. What I don’t understand is why Cochran is letting the town vanish when it could be helping the community with jobs and more people to Cochran instead of everyone going to Eastman or Dublin. If you can not answer this question please review me to who I may ask? Thank you, I am glad you enjoyed the book. Cochran has some what of an good ol-boy attitude which has kept, or forced out, some industries. I believe that over the years this will change more, but that remains to be seen. How was the printer to work with?